This is a serious concern for a storyteller, as for anyone who chooses to get up in front of people and talk. We need you to listen. We are a tiny bit obsessed about this, because if you aren’t listening, all we are doing is pushing some air around with our lungs, and maybe jumping up and down a bit, or flapping our arms. As I worried at the side of the stage that day, I was overlooking two things. The first is the extraordinary politeness of the Japanese. There is no way they would leave me hanging. Ever. The second is that when you love a story so much and know it so well that you wear it like a beloved old sweater, an audience will delight in hearing the same story again, in your unique voice, and they will laugh at the punchlines even harder the second time around. There is great satisfaction in engaging many ages at once. The universal willingness to suspend disbelief gives the teller of tales substantial leeway. But different audiences call for different approaches. In general, children can cheerfully chant through multiple repetitions of the action in a story; adults need them trimmed. 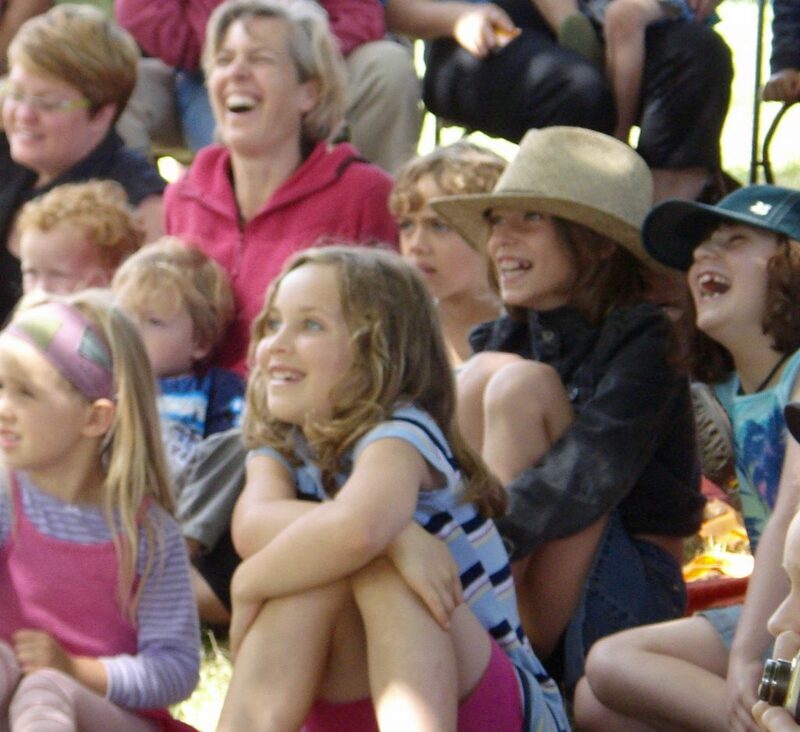 Kids are keen to participate, whereas adults are cautious, especially in a smaller group. It’s also harder to read their response, as they have spent years learning to mask both boredom and enthusiasm. There is no such concern with a young audience. At the instant their interest wanes, they will talk, tug at their neighbour’s socks, find a piece of the floor they can peel apart, pull their arms into their t-shirts, braid each other’s hair, and put a piece of gravel up their nose. If they are engaged, on the other hand, they fall into a trance, unconsciously mimicking the teller’s every word and gesture. Families gather for a community show in Japan. 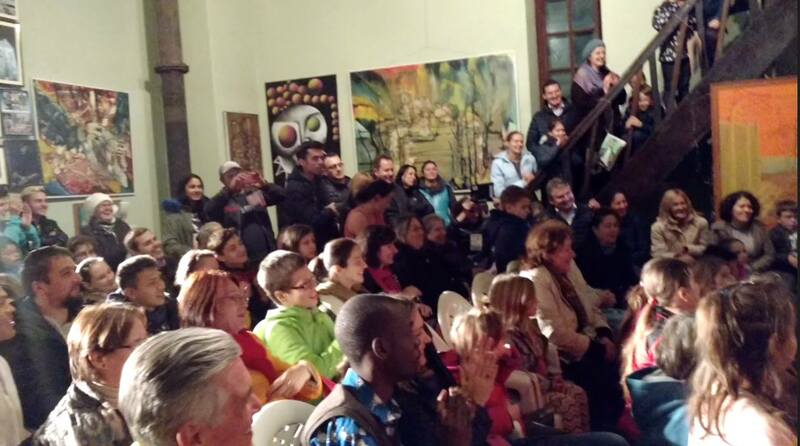 At storytelling festivals in Romania, audiences sat -or stood- through shows that ran as long as three hours. Different cultures, also, listen differently, and our listening has changed over time. In the course of 30 years of performing, I have witnessed a trend in Canadian and American family audiences, where adults now tend to go to the back of the room with their cell phones while children crowd to the front, largely unsupervised. (Good luck.) 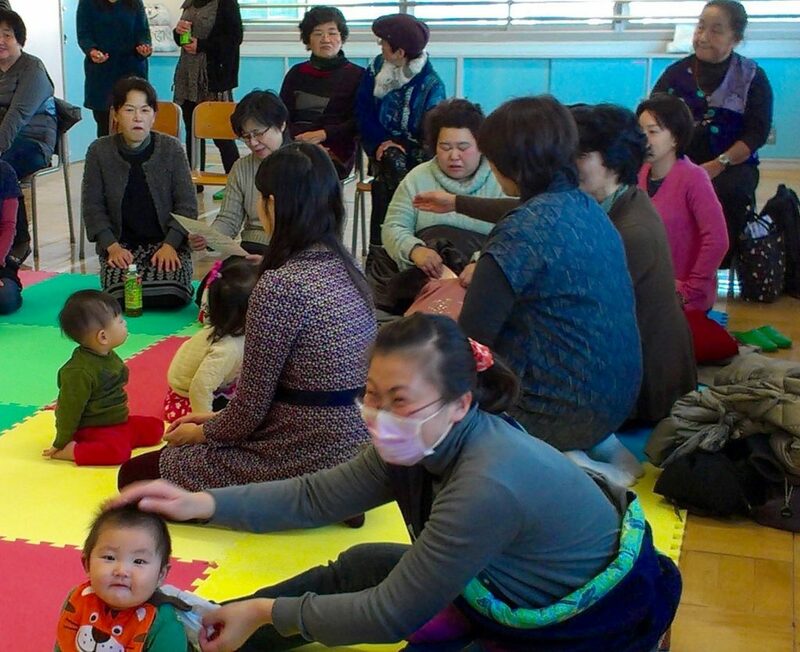 When I performed in Japan, families sat in clusters. Babies and small kids were physically connected to adults – on laps or leaning into each other. An unobtrusive move on the part of the adult was all it took to settle a restless child. At festivals in Romania, gala family shows were long by North American standards, running for up to three hours. Yet the whole family – seemingly the whole town – was there from start to end, whether the show started at 5:00 in the afternoon or 6:00 or 7:00, regardless of the day of week. They had incredible staying power. Nowhere else have I seen a family show that would run straight through supper time, bath time and bedtime, and to a packed hall. String figures, puppets, and other props might help engage an audience, but they are not everyone’s style and they are not always appropriate. What we do need to do is listen to the room. I have often been asked if I grow tired of repeating material. I don’t. I love the process of honing a story by listening to the audience. When that rustling level of hidden sound creeps up, I make a mental note of where I am in the story, and I change it, or take it out. This is my editor. A “rustling” quiet is workable, and sometimes it’s all we’ll get. But when we know real quiet, it becomes our goal. High school students in Chile enjoying a trickster’s antics. There are tricks of the trade and ways to engage an audience, but if you choose to make a career of telling stories – or even a hobby – you can be sure there will be surprises. It’s easy to be thrown off balance and lose the audience. At those moments, indeed, it can feel like we are just pushing air around with our lungs. All the preparation and training won’t prepare us for what we don’t know is coming. 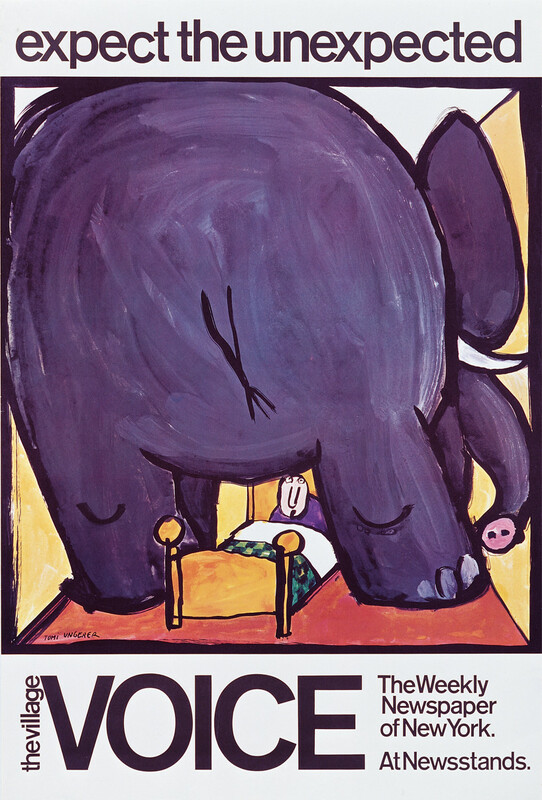 In my teen years I had a poster of an elephant crowded into a tiny bedroom with the title, “Expect the Unexpected.” It’s a great mantra for life, and certainly for performing. Expect the kid in the middle of 500 students in the gym to throw up halfway through your show. Expect the middle school teachers to leave you in the auditorium with 200 students and their soccer balls. Expect a dog to run into the school gym at exactly the moment in your story when a dog appears. (Go figure!) Expect a work crew on the other side of the wall to jackhammer intermittently throughout your show. Expect the story that worked well yesterday to fall flat today. Expect the emcee to introduce you by a name you don’t even know. Expect to pop in for a morning session at a school and end up there all day because someone held up a nearby bank and is driving around shooting at trees; the school is in lockdown, and anyway it’s clear that the best thing for this grade 7 class and their harried substitute teacher is for you to be here telling stories, all day long. Expect all that, and more. Clearly there is no way to anticipate all that can happen. Of course experience helps. But when a workshop participant asked me how to prepare for unknowns, I said, “Stand on one foot.” I was joking, but actually, it’s what I do. I practice balance. It can be as subtle as a shift of weight, and it’s what I did at the side of the stage that day in Japan. It kept me focused, and quieted my mental chatter so that when I stepped on to the stage, I could hear the depth of the quiet in the room as the audience listened to me tell the story they had just heard – that beloved old sweater of a story. And yes: they laughed even harder the second time around.